When it comes to Thanksgiving, I find that everyone has one dish that they couldn’t live without. There’s always one dish that makes the holiday for them. For me, it’s mashed potatoes made with Yukon gold potatoes, lots of butter, and cream. For my husband and his siblings, it’s this cranberry jelly – a recipe that has been handed down through four generations from my husband’s great grandmother. There would be rioting in the streets if this wasn’t on our Thanksgiving table every year. I used to think I hated cranberry jelly. My only experience with it had been with the canned stuff which was served in the cafeteria at my elementary school when they had the special “Thanksgiving lunch” . That experience pretty much turned me off to any cranberry jelly, sauce, or relish for the next decade or so. Fortunately, I met my husband who introduced me to fresh homemade cranberry jelly. It completely changed my mind and I became a cranberry jelly lover. Yes, there is a lot of sugar in it but it is just the right amount of sugar to balance the tartness of the cranberries without being overly sweet. When eaten with the turkey, you won’t even need the gravy. I also love to use any leftover jelly in the turkey paninis I make with the Thanksgiving leftovers. Cranberry jelly is so popular at our Thanksgiving meal that my husband and nephews actually get upset over who might be taking more than their fair share of the jelly. So, I am thinking I might make a few servings in these individual sized molds in addition to the one large mold I usually use. These small molds are actually individual cupcake pans that I found at Bed, Bath, and Beyond. Umolding the jelly from these small pans was a little tricky and required some experimenting but I eventually figured out a method that worked consistently. Scroll down to the Notes in the recipe for details. If you are concerned about unmolding these, you also could pour the jelly into small ramekins for serving. Put cranberries and water in a large saucepan over medium high heat. Bring to a boil. Then reduce heat to low. Simmer cranberry mixture for 20 minutes, stirring often to prevent sticking. Pour mixture through a fine sieve set over a second saucepan, pressing very firmly on solids to release as much juice as possible (I also scrape the outside of the sieve with another clean spatula to help release the juice). Stir sugar into strained cranberry mixture and cook over medium low heat for 2 minutes or until all the sugar is dissolved. Pour cranberry mixture into desired mold(s) and chill until firm. 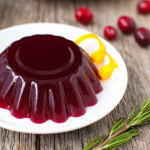 Cranberry jelly can be kept covered and chilled in the refrigerator for 4 days. Keep the jelly in the mold until ready to serve. To unmold from the small pans, set the mold on a large slotted spoon and then lower the mold into a pan of very warm water so the water reaches almost to the rim of the mold. Be careful to not let water get into the mold. Hold the mold in water for 10 seconds, then remove the mold from the water and wipe the outside of the mold dry. Holding the mold at a 45 degree angle with one hand, firmly tap the mold against your other hand until the jelly starts to slide away from the mold. Gently press down on the top edge of the jelly to release it from the mold, then quickly flip the jelly over onto a serving plate and remove the mold. To unmold from larger molds, set the mold in a large bowl of very warm water so the water reaches almost to the rim of the mold. Be careful to not let water get into the mold. Let stand for 20-30 seconds, then remove the mold from the water and wipe the outside of the mold dry. Carefully run a sharp thin knife around the inside edges of the mold. Holding the mold at a slight angle, gently tap and rotate the mold until the jelly starts to pull away from the mold. Place a serving platter upside down on top of the mold and invert the platter and mold together. Gently shake the mold until you hear the jelly begin to release, then lift off the mold. If the gelatin does not release, return the mold to the warm water for 15 seconds, then repeat the steps.